Lava shores have divided the keepers long enough, time to make 'peace' and use what's left of your rivals to mop up the heroes. 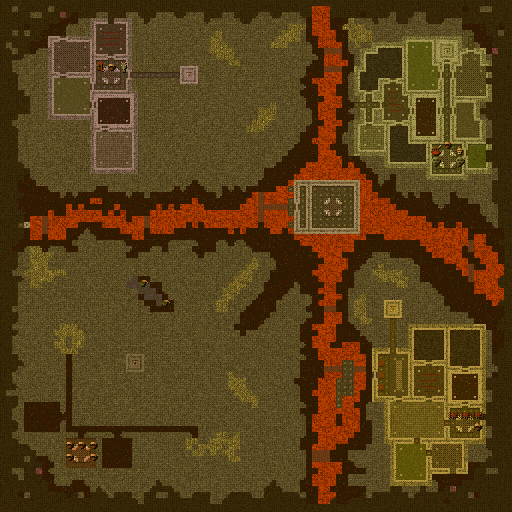 After playing several maps where each keeper has his own corner with lava or rock in between that don't work, I thought I should make one that does. The result is a pretty basic map that feels familiar. Safely build up your dungeon in your own corner, take on the keepers, then take on the heroes. Only difference is that you cannot claim their dungeons before they are defeated. The map is not very difficult, although if left alone too long Blue will fry you with lightning, Green will overwhelm you with vampires and Yellow will destroy you with traps. Download it here. Requires at least KeeperFX 0.4.6, but I recommend using KeeperFX Unofficial 0.4.6. Have fun. Questions or Feedback are welcome. Last edited by YourMaster; September 15th, 2017 at 23:37.